‘So, I see you bought the low-fat cottage cheese rather than the fat-free,” said Betsy Lerner’s mother, Roz. A chance remark? An aside? An observation? Oh, gentle reader! You either get it or you don’t. This conversation wasn’t about cheese. It wasn’t about calories or flavour or the small print on product packaging. It was about everything that ever happened between Betsy and her mother. It was a hand grenade. No, it was an atom bomb. It was world war three. Because here, according to Betsy, is the translation: are you ever going to be good enough? That question had been at the heart of Betsy’s relationship with her mother for as long as she could remember. It is at the heart of many mother-daughter relationships. Perhaps it’s especially central to those relationships where the mother is today in her 70s, 80s or 90s and the daughter in her 40, 50s or 60s. Betsy and I are of that daughter generation – both in our early 50s, with mothers in their 70s (mine) and 80s (hers). What’s significant for us, and for our generation, is that our mothers – on the whole – did not do paid work. They belonged to the last cohort of at-home mothers; we were the first who combined raising children with earning money. Every generation reinvents itself; every generation changes the world – but this was a revolution. It was a cliff edge and when we jumped off it, hoping our parachutes would open, we looked up to see our mothers peering down at us and shaking their heads. They didn’t think we could make this leap because mothering had taken up all of them. How could we possibly give enough to the next generation, if we were working as well? Then something else happened. Roz had an operation and Betsy went to stay with her while she recuperated. Through those days there came to the front door a procession of well-turned-out, silver-haired ladies, each asking how Roz was getting on, and each bearing a casserole or pot supper. These were Roz’s oldest friends, her bridge group: five women who had met each Monday for five decades to play bridge. As a child, Betsy had found them fascinatingly chic; as a teenager, she thought them hopelessly square. As an adult, working hard to carve out her career as a literary agent in New York, they seemed like relics of another age, a time in which ladies had nothing to do but lunch and spend the afternoon snapping down cards around a table. Betsy Lerner on her wedding day with her mother, Roz. But underneath Roz’s veneer there lurked a sensitive, caring spirit that understood what matters most – even if it wasn’t what she shared easily. These days, when Roz rings her doorbell, Betsy has a different emotional response to the sight of frizzy hair through the glass. “I see her there and I’m glad. And when she goes away, I’m sad.” Everything is different now and Betsy is so grateful that she managed to transform her understanding of her mother in time. In the end, what we want from our mothers – and what they want from us – is acceptance. “Our mothers have been always trying to fix us, which has given us the message that we’re not OK the way we are,” says Betsy. Meanwhile, we daughters have been trying, silently and while screaming inside and crawling up the walls to fix them. Betsy’s book says, stop trying to fix one another. You’re both OK as you are. I am in the range of 50’s and Mom will be 80 in August. Our relationship has changed since Dad died March 2015. I go see her once a week now, and call every day. Puts phone done, comes back, lots of crackling and distortion on her end. More grumbling about the feeder. It seems she can’t hear me. Wow, great article! Every good parent wants their child/children to be the best they think he or she can be without recognizing the kid has their own agenda, goals, dreams etc. The ending of this article is perfect. Betsy, congratulations — it sounds beautiful and I’m looking forward to reading it. All the reviews you’re getting are damned insightful pieces of literature themselves! That says so much about your book — and you. Once again — soak it in. You deserve it! 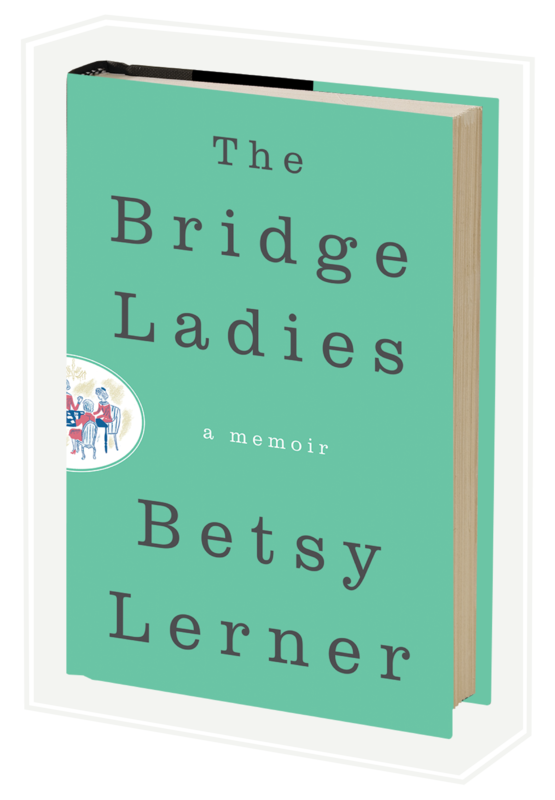 Betsy, I started reading The Bridge Ladies this morning. So far, so wonderful. Certainly a topic that holds the attention of most women. No offense to Greek mythology, but the depth of the mother-daughter relationship is far more complex than anything Oedipus experienced. Mine was a hen versus egg childhood: I’m still picking the last fragments of shell out of my hair. Congrats on this timely book! Who would you like to portray you in the movie version? They’ve always known us better than anyone else has, those mothers of ours; better, even, than we’ve known ourselves (better than we could ever know ourselves?). Each new generation has certain attitudes that affect the further development of all spheres. The changes of this kind are almost inevitable.